While many believe the very existence of Guantanamo Bay is a tragedy in itself, the story of Emad Hassan brings the tragedy and injustice to another level. For 13 years Hassan endured the cruel treatment at the military prison camp, over a misunderstood translation during his interrogation. Hassan was taken by Pakistani authorities in 2002 when they raided the home he shared with 14 foreign students and brought them all to a nearby prison after one phone call was received from someone connected to Al-Qaeda. After two months of abuse and questioning, he was sold to the United States military for $5,000. The translator was actually asking if he had any connection to “‘Al Qa’idah”, a small village with that name near his hometown in Yemen. The student replied yes, and no further questions would be asked. This seemingly minor mix up would cost the 22-year-old student 13-years of his life. Hassan remained imprisoned in the American prison in Kandahar for several weeks, until he was placed in a diaper and ear muffs and loaded onto a plane taking him to Guantanamo Bay, Cuba. The vast majority of detainees at Guantánamo Bay were arrested by local groups eager to profit from the bounties offered by the US government. In 2007, Hassan went on a hunger strike that would last longer than any other prisoner at the camp. He would be brutally force fed twice a day for years to come. Hassan has never been charged with a crime and was cleared for release unanimously by six different branches of the US government, including the FBI and the CIA, in 2009. Hassan was not alone, currently 52 of the 116 remaining prisoners have been cleared for release — never having been charged with any crime, leaving reasonable people to question whether they ever belonged there at all. 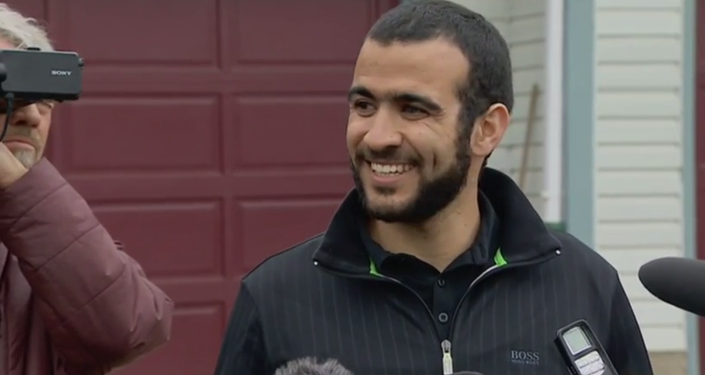 “You could have 10 witnesses stating that the detainee was not at an Al-Qaeda training camp. [But] if one detainee said he kinda looked like someone that was there, if there was any suspicion that someone might have been involved, they would not have them released.” Mark Fallon, former deputy commander of the Criminal Investigation Task Force, an organization created in 2002 to investigate detainees captured in the war on terror told Newsweek. The United States blames the indefinite detention on a lack of countries willing to take the prisoners back. On the evening of June 12, 2015, still on the hunger strike that he began in 2007- Gitmo guards entered Hassan’s cell. He was once again stripped from his clothing and put into a diaper, ear muffs, and a blindfold. He was taken on an airplane, without any indication of where he was going. Hassan landed in Oman, a country which took him in on humanitarian grounds. While local reporters claim to have been warned not to attempt interviews with former Gitmo prisoners, Hassan is at least, finally free.